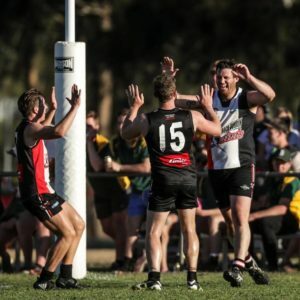 A MATT Seiter-inspired Brocklesby-Burrumbuttock produced a devastating final quarter to blow away Jindera by 20 points at Brocklesby on Saturday. Kicking with the breeze, the Saints kicked six of the seven goals in the last term to give coach Kade Stevens a dream start of the season. Seiter, Nico Sedgwick, John-Roy Williams and Ron Boulton dominated around the packs with Stevens and Nick Brockley bobbing up at crucial stages in attack. Jindera sorely missed ruckman Ben Dower who was denied a clearance from Albury late last week. “Everything gelled for us late,” Stevens said. “We fired on all cylinders at the right point of the game after Jindera probably outplayed us for the majority of it. “I think we are fitter than last year and have been training specifically during the pre-season for the way we want to play. A turning point in the final quarter came when Sedgwick launched himself into a pack and marked before slotting through the goal. While Seiter played well for Brock-Burrum, Jindera was pleased with the performance of Mitch Lawrence at the centre bounces and around the ground. Full-forward Trent Castles kicked six goals but was tamed late in the game by Jeremy Luff and a lack of opportunities. Ryan Speed, Sam Crawshaw and Rhys Preston were also prominent. 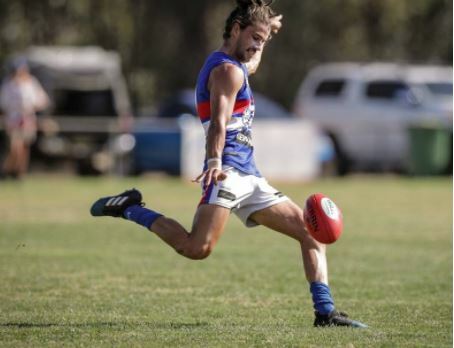 An eight-goal first quarter blitz paved the way for Holbrook to defeat rivals Culcairn by 49 points at Holbrook. Despite losing Isaac Lampe in the opening minute with a hamstring and Lachie Trethowan in the third term with a quad injury, the Brookers had more run with Aaron Baker and Curtis Steele dominating. Coby Ross was effective on a wing, Brock Knights patrolled the defence superbly and Sam Harris was strong in the clinches in front of a bumper crowd. 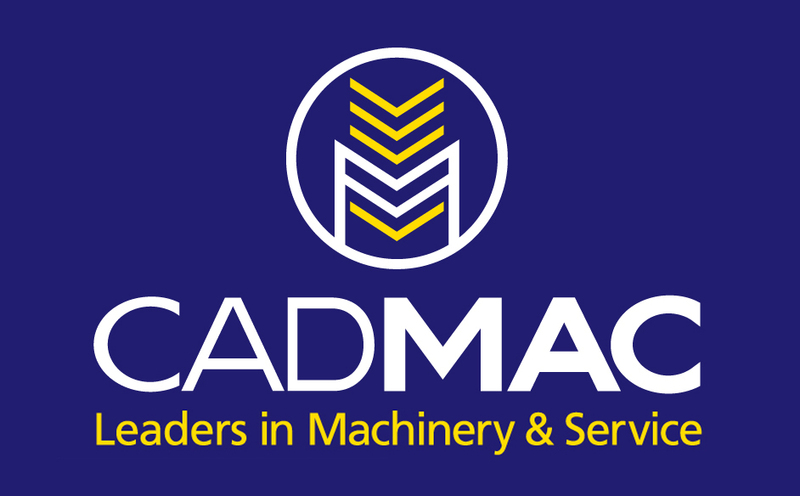 Culcairn veteran Brendan Way was the Lions’ best across half-back. Late Henty signing Dale Cox was sensational for the Swampies in their upset 15-point win over Osborne at Osborne. Cox, who played TAC Cup for Ballarat last season, provided plenty of dash across half-back with his cousin, Daniel, performing well in the midfield. “We were rapt to beat Osborne at Osborne first-up,” coach Joel Price said. Swampie Chris Willis and Azzi medallist Jamie Parr split the points in the ruck while Tim Brook won plenty of touches in the midfield. Rand-Walbundrie-Walla blitzed Lockhart late to win by 90 points at Lockhart. With both sides undermanned, Lockhart made a surge in the third quarter but the Demons’ fate was sealed when ruckman Zac Sheather was sent-off. 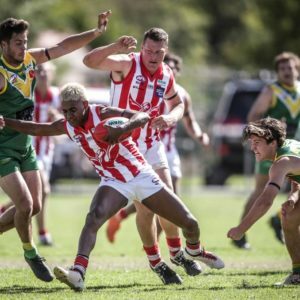 Howlong edged out CDHBU and Billabong Crows defeated Murray Magpies. The Power was hurt late when veteran Shannon Broadbent was sent-off.